The springtail is a very small prehistoric insect of about 0,2 and 1,5 mm. It is white and lives in humid culture, preferably potting compost. We sell the “the large springtail” with a length of about 1.5. mm. Spring tails are afraid of light and float on water. Therefore they are excellent for poisonous frogs. When you buy springtails as food, they can be kept in the supplied box. Is it your intention to rear them then we advise larger accommodation. Size of the nursing tray is up to you. You can rear springtails with minimal ventilation. The ideal temperature is between 20 and 25 degrees Celsius. Temperature monitoring is very important: springtails will not survive temperatures of above 30 degrees Celsius! 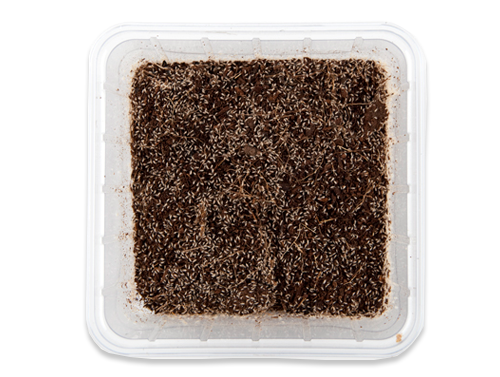 Springtails find their food in humid potting soil. Apart from that you can feed them a bit of 7-cerail mix.